The story of this mans life is intriguing! Trained as a youth in ballet, he came to Sydney with his coming of age. He met and worked with Mechthild in the 1970s in Balmaine during the formative years of his emerging adulthood. Mechthild had been christened mighty hand of God by Steiner and she had worked developing Speech and Drama in many continents all through her life. Bell from Bell Shakespeare is reported to have gathered much of his Shakespeare insights courtesy of his training with Mechthilde and her colleagues. But, back to Daniel Freeman. He trained in Eurythmy, in Speech and Drama, in Etheric Massage and in Bothmer Gymnastics amongst other things in Europe. He has been principal of New Zealand Steiner Schools and fought battles with Ministers for Education across the ditch to maintain a breathing space for Waldorf pedagogy. 1975-77 : Bothmer Gymnastics, Frau Krause Stuttgart West Germany, Rhythmische Massage ausbuildung. Frau Dr Hauschke, Bad Boll Germany. Completed Arbeits Practicum for: Massage in Friedrich Huesserman Klinik, Eckwelden, Schwartzwald Freiburg, Bothmer, in Priestes Seminar Stuttgart and Schauspeil Ausbuildung aus Anthroposophische Art, Stuttgart. Returned to NZ end of 1978 and started work in Taikura, then known as Queenswood Rudolf Steiner school. 2003-2005 Established Residential Home for Physically and Sexually abused Children in Manila, Phillipines For Bantay Bata. During this time began teacher training with Teachers and Parents interested in beginning Upper School in Manila. School (Kawayan), opened 2004. Gave workshop in Massage at International Doctors Medical Training over 2 years under Frau Dr. Gloeckler. 2005 - till date : Has worked with many schools in NZ to introduce bothmer gymnastics, given workshops on child observation, general pedagogy and discipline. He has also given 4 intensive induction course in Bothmer in Adelaide, Melbourne Bellingen (North NSW) and Sydney, Australia. He is currently retraining as a paramedic but continues to tutor at Taruna, the NZ Waldorf Teacher Training where he was a founding tutor in 1983. His wife Joscelyn is central in Anthroposophic Nursing in NZ and deeply involved with Weleda in Hastings. 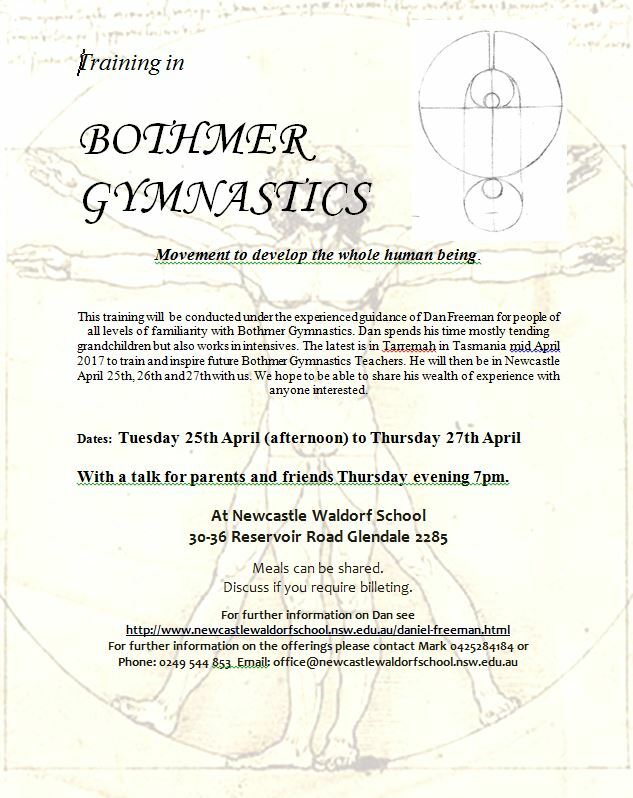 He spends his time mostly tending grandchildren but also works in intensives, the latest is in Tarremah in Tasmania mid April 2017 to train and inspire future Bothmer Gymnastics Teachers. He will then be in Newcastle April 25th, 26th and 27th with us. We hope to be able to share his wealth of experience and interest with anyone interested.